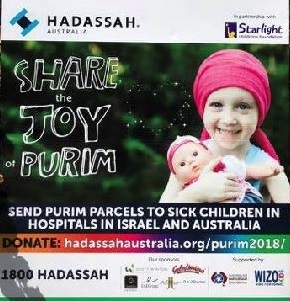 The successful 2018 Hadassah Australia fundraising campaign to send Purim Mishloach Manot (parcels) to children in Hospitals in Sydney and Melbourne as well as Hadassah in Jerusalem, brought together several Australian partner organizations to make sure that these Purim treats would be delivered. Hadassah Australia arranged for the Hadassah Dream Doctors (Medical Clowns) to deliver Mishloach Manot treats to young patients at Hadassah – From Australia to Jerusalem with love. 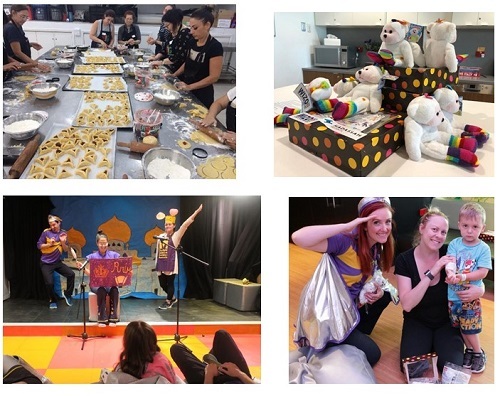 The 2018 Purim Project, which attracted extensive Australian media coverage and Jewish community involvement, was a multi-faceted fundraising campaign where supporters of Hadassah helped sick kids not only at Hadassah Hospital in Israel, but also at the Royal Children’s Hospital and Monash Children’s Hospital in Melbourne, and the Children’s Hospital at Westmead and Sydney Children’s Hospital, Randwick in Sydney. The support of the Australian Multicultural Foundation was critical for this campaign, as the Foundation encouraged the Starlight Children’s Foundation Board to endorse the Purim project. Purim was viewed in the context of Australia’s varied cultural traditions and the importance of exposing the broader community to a wonderful Jewish celebration of respect and freedom. As part of its involvement, Starlight Children’s Foundation organized fun, informal and educational activities centered on the Purim story in their hospital Starlight Express Rooms in Melbourne and Sydney. These outreach programs were run by Starlight Captains, who also educated participants on the Purim festival as a means of understanding cultural aspects of Judaism. Hadassah Australia continues to support the inspiring work being undertaken by the Hadassah Medical Clowns, bringing joy and fun into the lives of the sick kids at Hadassah Hospital. The Hadassah Medical Clowns do not distribute any other Mishloach Manot during Purim– this is exclusively a program for Hadassah Australia.